The march coincides with industrial action taking place throughout England, due to finish at 07:00 GMT on Thursday. 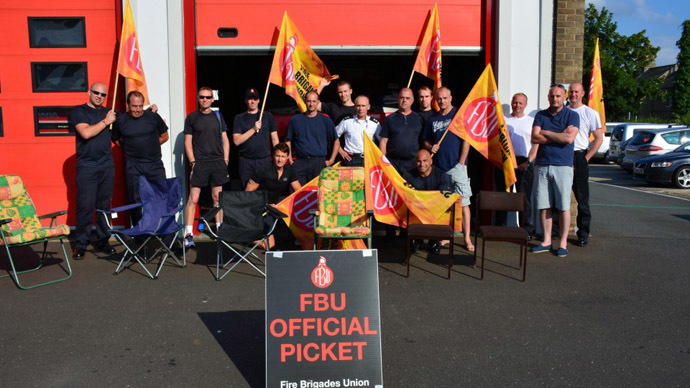 The Fire Brigades Union (FBU) accuses the government of backtracking on assurances made over pensions. According to the union, the government promised that firefighters over the age of 55 who failed a fitness test through no fault of their own would receive a full pension or a redeployed role. However, fire authorities and the Fire and Rescue Service have claimed that no such guarantee exists. The union accuses Parliamentary Under-Secretary of State Penny Mordaunt of lying to parliament after she made the assurances to the House of Commons. Mordaunt ducked out of an opportunity to debate with the FBU about the strike, the union claims. She allegedly ignored an invitation to appear on her local radio station, and has also refused to meet union representatives on three separate occasions. “We have been labelled ‘militant’ by the government however they are the ones refusing to talk to us and ignoring the concerns of firefighters,” he said. Twitter user @MistressPie, who proudly states she is “anti-establishment” on her profile, also offered her support. “#Solidarity with @fbunational as #firefighters strike today. They bravely put their own lives at risk to save lives,” she said. “The government has lied to firefighters over their pensions, thousands protest at Westminster Hall,” added freelance journalist Mark Rowe.